When you have to wake up early for a long day, the snooze button can be your best friend. You are just not ready to get out of bed and face the day yet. Plus, your bed is, like, so comfy. The Alarmshock, however, wants to end that by threatening to shock you. You wear the Alarmshock band, which locks to your wrist, to bed. 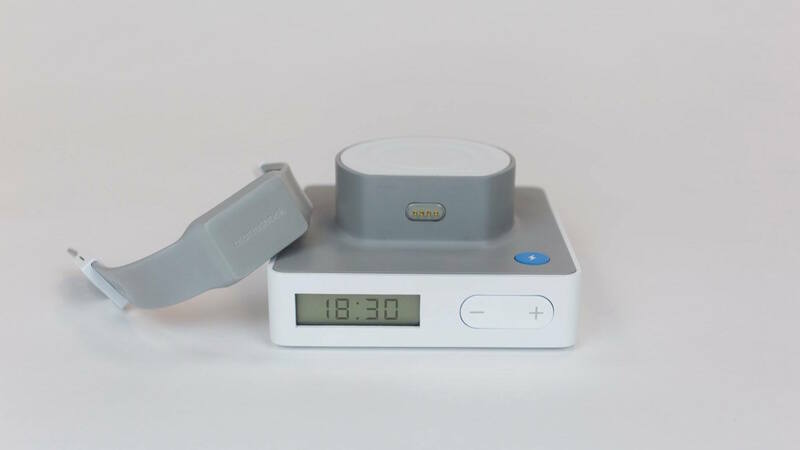 Once the alarm goes off in the morning, you have two minutes to unlock it and turn off the alarm by tapping it on the top of the Alarmshock dock, which you use to charge the band and set the wake-up time. It's kind of like those magnetized alarms retailers like to use, except if you forget to take off it'll shock you, rather than embarrass you as you try to walk out the door. The first electric shock is equivalent to that of a TENS machine, which tends to be used for nerve stimulation. However, the longer you stay in bed, the more powerful and frequent the shocks get. It's hard to imagine someone not waking up immediately after the first shock, but maybe you had a particularly late night or are a heavy sleeper. Now, Alarmshock wants to make it clear that the goal is to never wake you up with the shock. First, there's a regular alarm and a vibration on the band; an attempt to gently wake you up. It's when you ignore them that you feel the wrath of Alarmshock. It looks like it takes a maximum of five seconds to unlock the band, deactivate the alarm and take it off, so keep that in mind when you're frantically trying to avoid the shock. Or, you could also just put the dock as close to your bed as possible and roll your arm onto the dock when the alarm goes off and snooze anyway. The Alarmshock is currently on Kickstarter for $99 on an early bird special, with estimated delivery set for October 2017.